Have your ironing done at your home, or at our ironing room. We can pick up and deliver from your home or place of work. This is a pick-up service from your home or workplace, returned to you freshly ironed the following day. Hanging garments are supplied on hangers. Please return these with your next ironing order. You will be invoiced on completion for a casual service, or at the end of each month for a regular service. Get in touch with us to find out about our ironing charges. 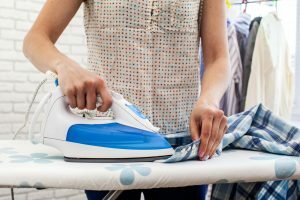 Our ironing service is available in all our service areas: Feilding and Palmerston Nth, Kapiti Coast, Hutt Valley, Wellington and Christchurch city and surrounding suburbs. We can also clean your residence, including your windows, and your oven.